BBC One Scotland will provide live coverage of Hearts v Aberdeen in the Scottish Cup on Saturday evening. Separated by 126 miles, the distance between the two rivals when measuring domestic success is wafer thin. Outside Glasgow they are the two most successful sides in the competition; Hearts winners eight times, Aberdeen seven. With both riding high in the league, the weekend meeting brings together two potential winners of the trophy, but one will see their hopes end before January is out. 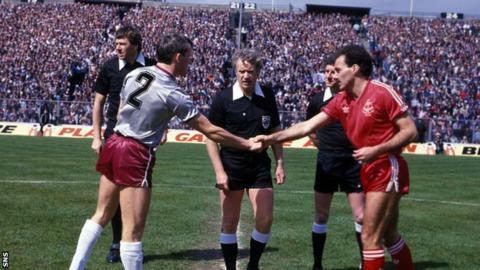 BBC Scotland takes a look at six previous occasions when Hearts and Aberdeen have gone head-to-head in the Scottish Cup. It was the year Aberdeen played three Scottish Cup ties at Tynecastle. Sir Alex Ferguson was leading his side towards retaining their league title, while the Cup had not moved from the Pittodrie trophy room for three years, with the Dons chasing a record fourth season in a row as holders. Alex MacDonald was putting a good side together in the capital, one that would go so close to winning the league and Cup double the following season. The quarter-final clash in Gorgie promised to be a cracker and just under 24,000 saw Sandy Clark give the hosts a second half lead, but Eric Black headed in an equaliser to take the game to a replay. Four days later and another 24,500 made their way to Pittodrie where Billy Stark's goal was enough to put Aberdeen into the last four, which meant a return to Tynecastle for the semi-final. After a replay, Jim McLean's Dundee United finally put an end to Aberdeen's Cup heroics. Hearts: Smith, Kidd, Whittaker, Jardine, R.Macdonald, Berry, Mackay, Watson (A.Macdonald), Clark, Robertson, Black. Aberdeen: Leighton, McKimmie, McQueen, (Bell), Cooper (Porteous), McLeish, Miller, Black, Simpson, McDougall, Angus, Stark. Aberdeen: Leighton, Mitchell (Bell), McKimmie, Stark, McLeish, Miller, Black, Simpson, Porteous (Cowan), Angus, Hewitt. Hearts: Smith, Kidd, Whittaker, Jardine, R. Macdonald, Levein, Mackay, Berry (Watson), Clark, Robertson (McNaughton), Black. It could have been Hearts' greatest season. Just three years after being in Division One, the Tynecastle side were hurtling towards a league and Cup double. After John Colquhoun's goal saw off Dundee United in the semi-final, the stage was set for the mother of all parties. All that was needed was for Edinburgh rivals Hibernian to join them at Hampden, but the signs were ominous straight away when Aberdeen despatched them 3-0 in the other semi-final, having already done the same earlier in that season's League Cup final as they chased a double of their own. Of course, what should have been Hearts' finest moment turned into one of their worst. By the time 40,000 Hearts fans descended on Hampden, it was in defiance more than celebration after Celtic had beaten them to the championship a week earlier. There was no sympathy from Aberdeen, who were ahead inside five minutes through John Hewitt. And after he had doubled his tally Billy Stark put the icing on the cake. Aberdeen: Leighton, McKimmie, McLeish, W.Miller, McQueen, Bett, Cooper, McMaster (J.Miller), Weir, Hewitt (Stark), McDougall. Hearts: Smith, Kidd, Jardine, Levein, Whittaker, Mackay, Berry, Black, Colquhoun, Clark, Robertson. The sides could barely be separated in the league, both eventually finishing on 44 points each - Aberdeen's slightly superior goal difference edging them ahead of Hearts into second place. It was a different story in the cups. Aberdeen had already beaten Celtic and Rangers on their way to lifting the League Cup and were once more eyeing a cup double. However, they had not yet got the better of Hearts in three league meetings that season and 22,500 packed Pittodrie for the tie of the round. The Dons made light work of the visitors, with Jim Bett, Hans Guilhaus, Brian Irvine and Charlie Nicholas all hitting the net while John Colquhoun's strike turned out to be a mere consolation for the shellshocked visitors. Alex Smith and Jocky Scott went on to lead Aberdeen to the cup double, despatching Dundee United in similarly ruthless fashion in the semi-final at Tynecastle before a shoot-out win over Celtic in the Hampden final. Aberdeen: Mimms, McKimmie, Conor, Grant, McLeish, Irvine, Nicholas, Bett, Mason, Van der Ark, Guilhaus. Hearts: Smith, Kidd, McKinlay, Levein, McCreery, McPherson, Colquhoun, Berry, Robertson, Crabbe (Foster), Bannon (Mackay). By now, Hearts' trophy drought had stretched to 34 years. However, much like 1986 and 1990, Aberdeen met Hearts in the Scottish Cup having already claimed the League Cup and were eyeing more silverware. After both sides avoided Rangers and Celtic in the draw, they quietly felt their chances of a Hampden final had been boosted. In one of the most dramatic endings in semi-final history, John Robertson broke the deadlock with just 10 minutes left. Duncan Shearer thought he had taken the game to a replay with a late equaliser, but the Dons' celebrations were short-lived when Allan Johnston found a winner for Hearts in the dying seconds. Jim Jefferies could not lead his side to the trophy that season with Brian Laudrup inspiring Rangers to a 5-1 win in the final, however two years later and they would get their revenge on the Ibrox side and finally see maroon ribbons on the trophy again. Aberdeen: Watt, McKimmie, Woodthorpe, Glass, Inglis, Smith, Miller (Grant), Windass, Bernard, Dodds, Robertson (Shearer). Hearts: Rousset, Locke, Ritchie, Mackay, McManus, Bruno, Johnston, Colquhoun, Lawrence (McPherson), Fulton (Robertson), Pointon. Hearts' title challenge was faltering by February, however they would go on to split Celtic and Rangers and finish second in the league under the tutelage of four different managers during the campaign. For the visit of Aberdeen, Graham Rix was the man in the dugout and the Dons dominated the first 45 minutes but somehow found themselves 3-0 down through goals from Michal Pospisil and Calum Elliot and a Stephen Pressley penalty after Zander Diamond had been sent off. Jimmy Calderwood's men could not recover and Hearts went on to beat Hibernian 4-0 in the semi-final before lifting the trophy with a penalty shoot-out win over Gretna. Hearts: Gordon, Neilson, Pressley, Webster, Beslija (Wallace), Cesnauskis, Brellier (McAllister), Johnson, Goncalves, Elliot (Makela), Pospisil. Aberdeen: Langfield, Clark, McNaughton, Severin, Anderson, Diamond, Foster (Stewart), Nicholson, Smith (Snoyl), Crawford, Griffin (MacAulay). Saturday will be six years to the day since Hearts and Aberdeen last met in the Cup. The fortunes for both were vastly different to this season, with Hearts sacking manager Csaba Laszlo less than three weeks after this game, while Aberdeen were struggling to make waves under Mark McGhee. The apathy from both sets of fans was clear with just 8,226 making it along to Pittodrie to see Darren Mackie and Lee Miller grab the crucial goals to put Aberdeen into the next round. Aberdeen's Cup run would not last long, being brought to a halt in the next round by Raith Rovers. Aberdeen: Langfield, Ross, Ifil, Mulgrew, Pawlett, Young, Kerr, Marshall (Maguire), Fyvie, Mackie, Miller. Hearts: Kello, Cinikas, Zaliukas, Bouzid, Visconte, Suso (Templeton), Black, Robinson (Obua), Jonsson, Smith (Nade), Stewart.